Alex, seventeen and traveling alone in the Michigan wilderness, is on a mission to bid her goodbyes to the world. She has a brain tumor that appears unstoppable, even with experimental treatments. While Alex is on her backpacking adventure, an electromagnetic pulse—EMP—rocks the earth, killing many people. Yet after the EMP, Alex is not only alive, but changed. The sense of smell she had lost due to her cancer treatments is now so keen that she can smell emotions, such as fear. Alex discovers that almost all others who are left alive are very old or very young. Generally, after the EMP blast, middle-ages folks are dead and teens become zombie-like—Alex refers to them as ‘brain-zapped.’ While the brain-zapped don’t eat one another, they crave human flesh. The combination of troubles is post-apocalyptic: teen zombies, a dying earth with fried technology and no means of modern communication, and a remaining population with no means of producing goods, including food. The worst in people comes out, and they fight and kill for survival supplies. When the EMP takes place, Alex happens to be talking to a few people she met on her wilderness hike, a little girl named Ellie and Elle’s grandfather. The grandfather dies immediately, and Alex becomes Ellie’s protector. Later she teams with the hunky but shadowy Tom, who is on leave from the war in Afghanistan. They fear that they, too, will become brain-zapped. Their goal is to travel to safety, to find a town and some help. But along the way, danger separates them. Tom is wounded as survivors are stealing his provisions, and his wounds become infected. In seeking help, Alex finds a surviving town called Rule. Rule is an odd place. Folks are deeply religious, but in a way that demands subservience from women. The fact that the folks in Rule are helping Alex is more sinister than it first seems. These survivors appear to be as dangerous as the zombies. Except for Chris, who has a crush on Alex. Bick does a great job of framing her post-apocalyptic world and of explaining how such a thing might happen as well as hinting at the reasons why some young people like Alex, Tom, and Chris have survived. In all, she does a great job with drawing the reader in. Her writing is also very good. Given these things, and the fact that no plot points are concluded, most teens will quickly leap to the next book. However, Bick also spends a good portion of the novel with lengthy descriptions of the gross realities of this new world. 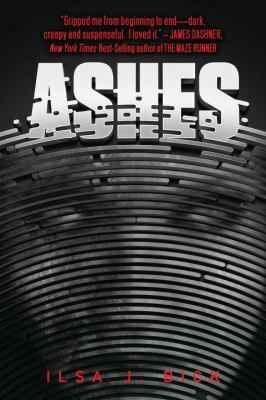 Ashes is an A-One gore-fest. Bick has that paradoxical ability to stop the story dead in its tracks to wax on about zombies plucking out eyeballs and livers, and yet to make it feels like this is fast-paced action. I’ve mentioned before that I’m something of a sissy in these matters. While the blood jets, the shootings and other violence didn’t get to me, I couldn’t stomach the frequent and vivid descriptions of pus—yellow-green, oozing, stinking. I read while waiting for appointments—and thus in public places—and often found myself unable to continue, the bile rising in my throat, the gag reflex operating. For this reason, I’m not going to continue the series. But if you don’t have these sorts of issues, this is a heart-smacking work for mature readers (about 14 years and up). I’ve thought about why my reaction to books like Ashes is so different from Cormac McCarthy’s The Road, which is also set in a post-apocalyptic, violent world of survivalists and cannibals. I think it just comes down to the writing. McCarthy can make me realize all the terror of his world. I have the full emotional impact, the genuine sense of horror and concern for the characters. But I’m never at risk of puking while waiting for the dentist. This entry was posted in Adventure Stories, Fiction, Mature Readers, Over 375 pages, Romance, Sci-Fi/Futuristic, Young Adult Literature and tagged Ashes trilogy, future dystopia, Ilsa Bick, science fiction, YA fiction, YA literature. Bookmark the permalink.